Chicago Blackhawks coach Joel Quenneville was fined $25,000 US Friday by the NHL for inappropriate conduct during Game 1 of the team’s playoff game against the St. Louis Blues a night earlier. A mood of euphoric exhaustion carried over to the next day after the St. Louis Blues won the longest game in franchise history and got the upper hand against the defending Stanley Cup champions. Defenceman Alex Pietrangelo's legs were stiff and he said it felt as if the Blues played two games to beat the Chicago Blackhawks 4-3 in triple overtime in the opener of their opening-round playoff series. But he had a smile on his face. The game lasted 100 minutes and 36 seconds. The teams combined for 94 shots, loads of great saves by the goalies and one temper tantrum. Blackhawks coach Joel Quenneville apologized Friday for making an obscene gesture while reacting to a call that wasn't made in the first overtime. He was fined $25,000 for inappropriate conduct. "I was definitely excited. 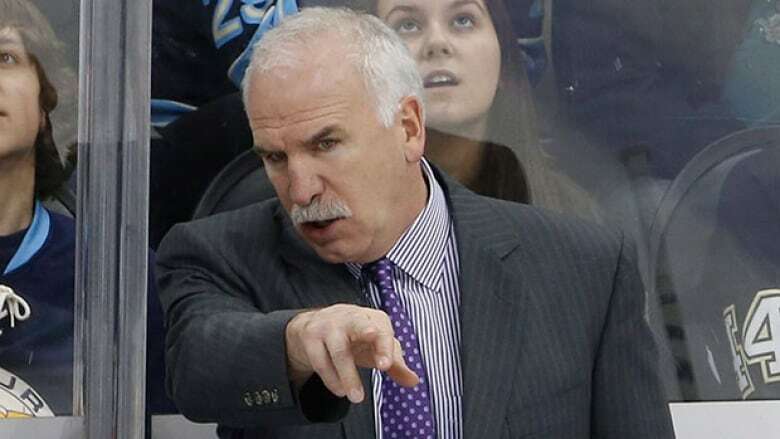 Disappointed with the call, but I apologize for my behavior," Quenneville said. "It wasn't very appropriate at all. It was a bush-league move on my part." Blues forward Ryan Reaves was in the penalty box for delay of game after flipping the puck in the stands when defenceman Kevin Shattenkirk, while jousting with a Blackhawks player, also inadvertently flipped one over the glass. Quenneville raised his arm in protest and then grabbed his crotch after officials elected not to call a second penalty that would have given Chicago a 5-on-3 advantage for about a half-minute. "I saw the highlight," forward Patrick Sharp said. "Joel's a passionate coach and he's intense on the bench. I think sometimes he wants to get his skates on and go out there and play with us." Blues coach Ken Hitchcock joked that it wouldn't have mattered because "we're so good on 5-on-3s." "Yes, I saw what Joel did," Hitchcock said, still smiling. "I saw it, but I'm not commenting. It would be inappropriate." Everyone played a lot, and it's a short break before they return to the ice for Game 2 on Saturday afternoon. Pietrangelo logged a whopping 44 minutes and 8 seconds of ice time. Blackhawks defencemen Duncan Keith and Niklas Hjalmarsson played 40 minutes each and 11 others — eight of them Blues — played 30 or more minutes. St. Louis defenceman Jay Bouwmeester, who holds the longest iron man streak in major sports with 717 consecutive games played in the regular season, fell just short of 30 minutes after becoming dehydrated in the first overtime. Despite the workload in Game 1, goaltender Ryan Miller was on the ice briefly Friday, among 10 players skating. The Blackhawks did not practice. Miller surrendered three goals on seven shots in the first period, a continuation of his slump that coincided with the Blues' six-game losing streak to end the regular season. He finished with 32 saves in a row, many of them spectacular, keeping the Blues around long enough for Jaden Schwartz to tie it late in regulation, and for Alexander Steen to end it in the opening minute of the third overtime. Corey Crawford was almost as good and faced a lot more rubber, totaling 48 saves. "Honestly, I don't even think about it," Crawford said. "I feel like I just kind of get in the zone and I'm just reading the plays." Blues forwards T.J. Oshie (head) and Patrik Berglund (shoulder) had rigorous workouts at the optional skate Friday and Oshie in particular looked ready to go. The Blues got a big boost in Game 1 when several players returned, and forward Vladimir Tarasenko was a game-changing presence coming off a 15-game layoff with a broken right thumb. "Now, all of a sudden we look like we're dangerous off the rush again," Hitchcock said. Blackhawks stars Patrick Kane and Jonathan Toews also came back from lengthy layoffs without missing a beat. Kane's breakaway goal put Chicago up 3-2 late in the first period and Toews had two assists. "They were both really good in a lot of ways," Quenneville said. "Kaner had the puck a lot, made a lot of nice plays. Taser played his normal game, he's so reliable and effective in all areas and we use him in all situations." Don't look for a repeat of the five-goal first period. Blues captain David Backes said the start of Game 1 was the "track meet" the Blackhawks desired. "I didn't mind the way we played," Quenneville said. "We had the lead, we were close to getting it finished. Certainly, you'll take your lumps." The Blackhawks played six overtime games en route to the Cup last season, going 4-2. They've learned to compartmentalize and Quenneville plans no lineup changes and Crawford said "I don't think anyone's really worried in our locker room." "I don't know that there's much to dwell on," Sharp added. "It's a tough loss. It's a part of the playoffs." To encourage thoughtful and respectful conversations, first and last names will appear with each submission to CBC/Radio-Canada's online communities (except in children and youth-oriented communities). Pseudonyms will no longer be permitted. By submitting a comment, you accept that CBC has the right to reproduce and publish that comment in whole or in part, in any manner CBC chooses. Please note that CBC does not endorse the opinions expressed in comments. Comments on this story are moderated according to our Submission Guidelines. Comments are welcome while open. We reserve the right to close comments at any time. It is a priority for CBC to create a website that is accessible to all Canadians including people with visual, hearing, motor and cognitive challenges. Closed Captioning and Described Video is available for many CBC-TV shows offered on CBC Gem. ©2019 CBC/Radio-Canada. All rights reserved.